Over the last fifteen years, the Archaeology Live! training excavations have made many important discoveries and many more lasting memories. Once or twice a year, veterans of current and previous excavations get together in a quiet York pub to catch up and reminisce about memorable finds and features. As week eight of the 2015 season progressed, it became quickly apparent that we’d be talking about this one for many years to come! The All Saints, North Street excavation. It all started quietly enough, but little did we know we were in for a feast of amazing finds! Gary’s This End team started the week by giving the area a good clean before picking up work on a number of features. Gary’s team giving the trench a clean. Meanwhile, Arran’s That End team picked up right where they’d left off in week seven. Work on an enigmatic trample layer was taken over by Zena and Mazda. The deposit was laid in the early 19th century and its compacted nature tells us that there was heavy foot traffic in the area at this time. Zena and Mazda investigating a beaten earth surface. In the 2013 season, Zena was part of the team that helped to re-discover the lost church of St. John the Baptist on Hungate, while Mazda was making her Archaeology Live! debut. The pair proved to be diligent trowellers and as they peeled away the compacted layer of sandy silt, a pair of earlier structures began to emerge. What had appeared on the surface to be a handful of stones and bricks was beginning to look increasingly substantial! Over in Contrary Corner, perhaps the site’s trickiest area was taken over by Archaeology Live! regulars Janice and Linda. Linda and Janice excavating a suspected 19th century burial. Recent weeks had revealed an interesting sequence in this area, with repeated dumps of domestic waste from the neighbouring All Saints Cottages clearly being dumped into the site during its time as an active graveyard (1826-54). Underlying one such dump of seafood and animal bone, Janice and Linda began work on a rectangular feature that was highly likely to be a burial. Over in her slot through Church Lane, Liss was joined by new starter Rachel in the excavation of a newly discovered cut feature. Recent discoveries in the slot had revealed a well-laid 18th century road surface pre-dating the present paving stones and an underlying clay make-up deposit. With all of these features recorded, Liss and Rachel started to excavate their new deposit. Rachel and Liss discussing their sequence. The wooden handled trowel is sitting in the cut feature. Back in This End, Pandora was back in her ever-deepening sondage. This ‘trench within a trench’ had been positioned within a cell of the 1860s Church Hall foundations and aimed to investigate the site’s medieval horizon. By week eight, Pandora was in the thick of the Plantagenet era! On the other side of the wall footings, returnee Steve and new starter Robert were teaming up to tackle a large make-up deposit that had been revealed beneath the 18th century brick floor of the Rectory (demolished c.1855). Close-by, Itab was tasked with the excavation of a post hole. This was an interesting feature as it seemed to clearly pre-date both the 1860s Church Hall and the 18th/19th century incarnation of the Rectory. Were we looking at part of the Rectory’s original medieval structure? Itab working on her post hole. As the backfill was excavated, packing stones were revealed around a clear post-pipe (void left by a rotted timber post). Itab’s post hole during excavation. By the end of the day, the sun was shining and the team were in full swing! Digging in the afternoon sun. After Monday’s solid start, the omens were good for a vintage week! Itab got started by recording the packing material within her post hole. As Steve and Robert continued to take up their make-up deposit, a much earlier sequence was beginning to emerge, including layers of burnt material that appeared to contain solely medieval ceramics. Steve exposing a late medieval deposit. Archaeology Live! legend Kirsten had recorded the backfill of an infant burial that had been cut flush to the Rectory’s boundary wall and was already well underway with the delicate excavation required to locate the coffin and remains within. Kirsten working on an infant burial. Over in Arran’s area, team That End were joined for taster days by Kristy and Ann. Kristy took over the excavation on a deep 19th century burial in the centre of the trench. Previous work had revealed that the grave’s southern edge hadn’t yet been reached, this meant that Kristy’s first job was to follow the edges of the cut to its southern terminus. Kristy and her first find. Kristy’s first ever ‘proper’ find was cracker, the rim of a beautiful Roman Greyware pot. While Kristy continued work on a known feature, Ann spent her day investigating a large area for any cut features. This tricky task involved trying to discern faint edges amidst a mass of soil, stone and brick rubble. Ann and Gus looking for new features. 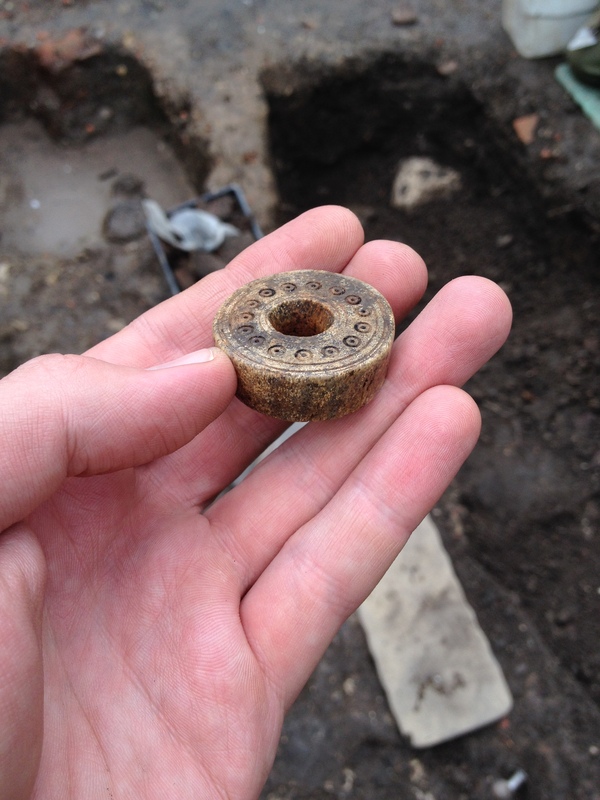 The day’s first unexpected discovery came from Liss and Rachel’s Church Lane slot. As it turns out, they weren’t digging a pit after all – it was a grave! Rachel and Liss asess their new discovery. As much of the feature is sealed beneath later structures that we can’t presently remove, only a small area was free to excavate; however, the discovery of an articulated human foot quickly removed any doubt as to the nature of the feature. While burials have been a major feature of the dig so far, these have all been set in the space between Church Lane and the site’s north-west boundary. Church Lane in the 18th century was a well-used thoroughfare with workshops running along one side, it certainly doesn’t seem an obvious site for burials! If a row of burials were present along the north wall of the church, the street will have been far narrower than it is today. Pandora beginning to disappear from sight while Steve and Rachel continue work on their deposit. Back in Gary’s area, it was Pandora’s turn for a surprise! While Steve, Robert and Rachel continued to expose the later medieval horizon, Pandora was delighted to find a tiny Roman coin. Referred to by archaeologists as minims, these copper or brass coins were minted between the 3rd and 4th centuries and would have been a common sight in Roman York as they were essentially small change. It was immediately apparent that Pandora’s latest find was a special one as it was in immaculate condition. Coins can be frustrating finds as they are usually found covered in corrosion that can only be removed by the painstaking work of YAT’s conservation team. In short, we normally have to wait quite a while to see the detail and imagery of our coins. This was no such problem for Pandora! Even before cleaning, the head of an unknown Emperor and the vague outline of text was clearly visible. The superior preservation of this coin may be a result of it being discovered in a medieval context, meaning it has been disturbed and re-deposited on fewer occasions than the Roman finds unearthed from Victorian deposits. What is truly amazing about this coin is that it was already a thousand years old when it found its way into Pandora’s deposit at the dawn of the middle ages. Once seen by our conservators and numismatists, we hope to be able to very tightly date this coin. Watch this space for updates! There is always a buzz on-site when an exciting find is unearthed and we often joke that you know you’ve found a good find when it goes on tour around the trench! No sooner had the last member of the team seen Pandora’s coin when Janice made an exciting discovery of her own in Contrary Corner. Janice and her medieval marvel! Hidden amongst countless sherds of medieval roof tile and fragments of animal bone, Janice had spotted a remarkable object in the backfill of her and Linda’s 19th century grave – a shard of medieval stained glass! Janice’s shard of painted window glass. All Saints, North Street has an internationally significant collection of medieval stained glass windows, some of which being one of a kind. Their survival has been the result of many fortuitous events and their conservation is an ongoing battle for the church. Despite this, many of the church’s windows have still been lost over the centuries, leaving us to wonder what treasures of medieval art fell foul of storms, vandalism and iconoclasm. To find a shard of glass complete with the brushstrokes of a medieval craftsman is a genuine and tantalising pleasure. We can never hope to see the whole masterpiece, but we can still marvel at this tiny fragment and wonder at what might have been. All Saints in the August sunshine. Wednesday dawned bright and sunny and the team couldn’t wait to get back on-site, surely we couldn’t top the discoveries of the previous day, couldn’t we? Gus, Becky and seven tons of sieved, recorded and excavated archaeology ready for its new life as topsoil. While the majority of the team enjoyed a tour of YAT’s conservation facilities and a talk on the architecture and history of the church, the staff and placements were hard at work filling a skip with material from the spoilheap. We’ve taken somewhere in the region of 50-60 tons of earth from the site now, all by trowel!! As work on-site resumed in the afternoon, we were happy to receive a visit from our former YAT colleague Patrick Ottaway and his group of archaeology students. Mazda planning a deposit while Toby leads a site tour. As Toby led the students through a tour of the trench, the whole team were busy with the recording and excavation of their features and deposits. Mazda and Zena had located a new deposit full of loose rubbly material and Kristy and Ann continued to make good progress in the centre of the trench. In Gary’s area, the digging, sieving and recording was equally industrious and a truly thrilling artefact was about to see the light of day for the first time in over seven centuries. Before this, however, Pandora, was delighted to find her second Roman minim in as many days. While it wasn’t quite in the same excellent condition as the previous day’s coin, it was a welcome addition to our burgeoning collection of coinage from Eboracum’s colonia. With a safe maximum depth almost reached in her slot into medieval deposits, Pandora had succeeded in finding the earliest deposits encountered on the whole site. As each layer of medieval dumping was recorded and lifted, the ceramic assemblage visibly changed. The vivid green glazes of 13th-14th century Bransdby and York Glazed Wares gave way to the more piecemeal and haphazard decoration of the aptly named splash-glazed ceramics of the 12th-13th centuries. Finally, at over a metre below the current ground surface, glazed pottery gave way to the Gritty Wares of the Anglo-Norman period – Pandora had taken us back almost 1000 years! Her final task was to straighten the sections and finish off any outstanding records and this diligence quickly paid off! While sieving the sticky, clay-rich material from her lowest deposit, Pandora noticed an oval of translucent orange material. It was immediately apparent that this wasn’t a pretty pebble, Pandora had found something truly special! The object was in fact a Roman intaglio, a beautifully carved gemstone that would once have been set in a ring of gold, silver, copper or iron. Intaglio rings would have been familiar objects to the inhabitants of Roman York in the 2nd and 3rd centuries. They are found with a huge variety of images carved in reverse and were used to authenticate documents and sign letters by stamping the seal of an individual into a wax seal. Deities and personifications are often depicted, allowing us a wonderfully personal insight into the ways the inhabitants of Eboracum chose to represent themselves. As with the heraldic tradition of the middle ages, the emblems chosen by the wearers of these intaglio rings can tell us a lot about their religious and ethical ideals and affiliations. It is little surprise that many intaglio unearthed in York bear the images of Mars and Minerva, these were after all the favoured deities of the military class. What is a surprise is the relative paucity of the assemblage; as the capital of northern Britannia, York must have been awash with these artefacts. In fact, Pandora’s find may be only the 40th intaglio to be found in York! The two most common materials for intaglios are cornelian and jaspar. The vivid translucent orange of cornelian will have been imported from Iran or Turkey, while the more opaque jaspar occurs naturally in Egypt. Pandora’s intaglio appears to be made of the former and features the image of a rather triumphant looking caped figure holding a military helmet with a spear under their shoulder and shield on the ground. Specialist assessment will allow us to determine whether this is a self-portrait cut to commemorate a victory or the image of a favoured deity. A Roman intaglio from the Hungate excavations. Pandora’s wonderful discovery is undoubtedly our finest Roman find from All Saints and allows us to glimpse both the mechanics of empire and the world view of one Roman citizen. We can only wonder how many documents bore the seal of this individual, but to be able to hold the very object is a rare privilege indeed. We will post a longer post on the history and significance of intaglios at the end of the 2015 season, for further reading in the meantime, see https://www.britishmuseum.org/pdf/1b%20rev%20order.pdf or M. Henig, A Corpus of Roman Engraved Gemstones from British Sites (BAR 8, 3rd edition, Archaeopress, Oxford, 2007. Kirsten and Robert backfilling a fully recorded backfill. Thursday of week eight saw more good progress at both ends of the trench. With the remains of an infant having been carefully exposed in her grave cut, Kirsten enlisted the help of Robert to record and then re-cover the burial. While the grave was only a small feature, Kirsten had recovered a huge range of finds including a highly decorative sherd of Samian ware. At the opposite end of the trench, Liss and Rachel were also finishing up the recording of a burial, although theirs was a whole century older! Liss and Rachel planning a burial. Having burials so close to the church during this period is unusual; it will be interesting to see if this is an isolated occurrence or similar along the whole run of the street. Several metres away, Mazda and Zena were dealing with very different deposits on either side of a stub of medieval wall. On the southwest side of the structure, Mazda continued to work through a loose, rubbly deposit with frequent fragments of animal bone. Zena was faced with a far more compacted trample layer, although the deposit was beginning to peter out by the end of the day. Back in Contrary Corner, there was a breakthrough moment for Janice and Linda as they successfully identified the outline of a coffin. The outline of a Victorian coffin is clearly visible in the left of the cut. After carefully pursuing a fairly noncommittal edge for some time, the presence coffin proved that Janice and Linda’s instincts had been right – they had very accurately followed the very same edge cut by the person who dug the grave almost 200 years ago! In the centre of the trench, Lydia and Cheryl joined us for a taster day. Their first archaeological challenge was to record and excavate a 19th century deposit that may (or may not!) overlie further burials. Becky guiding Cheryl and Lydia through the art of good troweling. It is possible that this area was never used for burials at all, as it is the most obvious processional route from the church. It will be fascinating to see what lies beneath this 19th century dump deposit! Cheryl and Lydia were an effective mother/daughter team! After a string of amazing finds, Pandora finally reached the maximum safe excavation depth in her slot. The trench within a trench had shown us a thousand years of stratigraphy and yielded finds that spanned two millennia! Now, all that was left to do was to take the final photos and tie up the final context cards. It was quite an emotional goodbye to a very productive hole!! As the weather forecast for Friday was particularly damning, the team ended the day with a flurry of activity, finishing up features and covering over any delicate remains. A peek into Contrary Corner. Liss and Rachel were quickly disappearing beneath the surface of Church Lane as they began to excavate a sandy surface that pre-dated their 18th century grave. Liss and Rachel descending into the post-medieval period. The sandy deposit was the third surface encountered within the slot and reveals that Church Lane has been steadily rising over the centuries. A sandy surface under excavation. As predicted, Friday was a fairly dramatic washout! Happily, several off-site activities had been held in reserve and the team could remain warm and dry inside the church. The first of these sessions was a seminar on the identification and treatment of small finds – individual artefacts that warrant special attention or research. This is an opportunity for trainees to handle an impressive array of objects and materials. The day wrapped up with Toby’s ever-entertaining matrix session. Together, the team built a particularly fantastical archaeological sequence (giraffes??) before breaking it down into a Harris Matrix – the flowchart that chronologically links all excavated features on a site. As 5pm approached, the team packed up and headed to the pub to celebrate an amazing week on-site. I’m sure tales of this week’s finds will be told at many future reunions! None of our amazing discoveries over the last fifteen seasons would have been made without the participation and support of our trainees. Weeks like this remind us of the power of public archaeology and the importance of keeping the profession open to anyone with an interest. Thanks as ever to all of the team! So, that was week eight! With just one third of the excavation left, we can only imagine what surprises are still in store for us! Best get digging then, onwards and downwards!